Sky’s Chris Froome attacked downhill at the crest of the final climb of Stage Eight of the 2016 Tour de France and led his pursuers over the finish line by 13 seconds, capturing a ten-second bonus and the race leader’s yellow jersey. Froome didn’t attack on any of the stage’s four categorized climbs, content to conserve energy. With the 198-rider peloton reduced to a field of just 13, the Team Sky leader had only to mark his General Classification rivals to preserve sixth place overall, one place ahead of his prime competitor, Movistar’s Nairo Quintana. Instead, Froome attacked unexpectedly at the crest of the stage’s final climb, the Cat 1 Col de Peyresourdes. Froome gained several meters’ advantage before anyone responded—he appeared only to be trying to grab some King of the Mountains points. By the time his rivals realized that Froome was stealing the stage, it was too late. Froome descended like a demon, sitting on his top tube and pedaling all the way down the descent at 50 mph. “It wasn’t really planned. I thought I’d give it a try in the downhill as the few tries on the climb didn’t work out. They were sticking to us. So I decided to give it a go in the descent, see if I could catch someone out,” Froome told NBC Sports. “It was old-school bike-racing, just having fun. “Tomorrow is going to be a hard stage. It’s only 20 seconds but I’ll take every second I can. 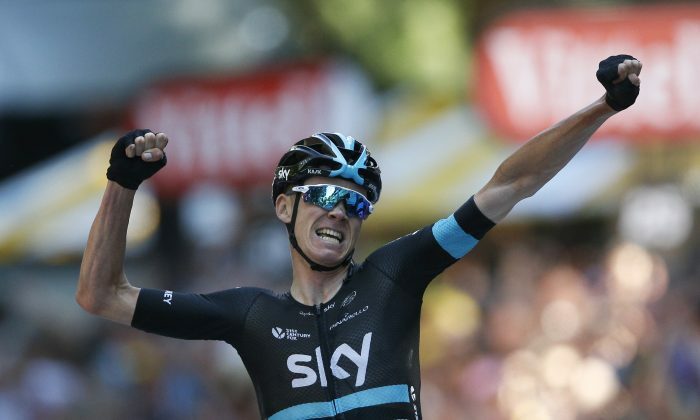 The 23 seconds Froome gained in Stage Eight could be decisive in the Tour. Now his rivals need to attack him just to get even; Froome can follow behind and let his rivals do the hardest work. The stage also showed the difference in strength between Team Sky and Team Movistar. Sky and Movistar took turns setting the pace and leading the chase, but Sky had more and stronger riders left farther up the final ascent. Nairo Quintana had only Alejandra Valverde to assist through most of the final climb, and Valverde was near the back of the group. Chris Froome had Sergio Henao up front through the entire climb—Henao even launched a couple of probing attacks—and had Mikel Nieve and Geraint Thomas riding strongly as well. Nairo Quintana might be able to equal Froome on the climbs, but the Sky team leader still has the advantage, because of his team’s depth. Tinkoff’s Alberto Contador looked tremendously more healthy in the very difficult Stage Eight. Before the stage started, he told the press that he had slept for nine hours and felt ready to go. This might have been dismissed as PR positivity, but the 33-year-old Spanish rider proved his words, staying with the GC group until halfway up the final climb. Contador finished the stage 1:41 behind his rivals—yes, he lost some time, but he was so strong for so long, it now seems possible that he could be on form in the crucial final week of the 2016 Tour. He might not be able to contest the overall win, but he could still enliven the final mountain stages.